Mercury emitted from American smokestacks has been declining for years. But contamination levels in loons, walleyes and some other species have actually increased in the past decade, according to the largest report yet on mercury in the Great Lakes region. The report, released by the Great Lakes Commission, was based on 35 research studies and samples from tens of thousands of fish, birds and other animals. It concludes that the forests, lakes and wetlands that characterize the Great Lakes make the region particularly sensitive to mercury pollution. Even more important, the authors conclude, the nature and extent of the region’s mercury problem is more severe than was previously known — and, for reasons that are not understood, appears to be getting worse for some species. The report found that mercury levels are higher in fish in inland lakes than those in the big lakes. That was true of walleye from northern Minnesota and other heavily forested areas with wetlands. Six of the 15 most commonly eaten fish had mercury levels higher than the EPA recommends for human consumption. And many species, including loons, showed sensitivities to mercury at much lower concentrations than had been known. Feeding a world with 9 billion people by mid-century, and feeding them while easing some of the environmental degradation that worldwide agriculture already wreaks on the Earth, is doable, but difficult. That’s the message of “Solutions for a cultivated planet,” a major article in the Journal Nature. Jonathan Foley, director of the University of Minnesota’s Institute on the Environment, was the lead author in an international team of scientists who wrote the article. It was published on-line on Oct. 12; it will be the cover story in the Oct. 20 print edition. — Halt the expansion of agriculture into tropical rainforests, partly by paying compensation for the ecosystem services those regions provide. — Increase crop yields in cultivated areas of Africa, Latin America and Eastern Europe. — Use fertilizers and water more strategically. — Shift diets to include less meat. — Reduce the one-third of the world’s food that ends up being wasted, spoiled or eaten by pests. If you subscribe to Nature, read the article here. Otherwise: read a University of Minnesota news release describing the article, read a Star Tribune article about it, listen to a National Public Radio report, or read a 2010 Freshwater Society interview with Foley about agriculture and the environment. Fred Kirschenmann, a national leader in the organic food and farming movement, will deliver the next free public lecture sponsored by the Freshwater Society and the University of Minnesota College of Biological Sciences. Student Center on the university’s St. Paul campus. Seating is limited. Please register to reserve your place. Mexico ships televisions, cars, sugar and medical equipment to the United States. Soon, it may be sending water north. Western states are looking south of the border for water to fill drinking glasses, flush toilets and sprinkle lawns, as four major U.S. water districts help plan one of two huge desalination plant proposals in Playas de Rosarito, about 15 miles south of San Diego. Combined, they would produce 150 million gallons a day, enough to supply more than 300,000 homes on both sides of the border. A baby turtle, about the size of a quarter, has caused a big stir and reasons for optimism with researchers at the Minnesota Department of Natural Resources. 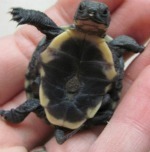 A Blanding’s turtle hatchling was discovered Oct. 6, at a study site in Martin County in south-central Minnesota. Until now, the youngest turtle identified in this population was estimated to be 14 years old. Brown is part of a research team that has been studying the Blanding’s turtle population since 2007. She said that although these turtles can live to be 80 years old, they have been hit hard by the loss of wetland and upland habitat through the years, drastically limiting their ability to reproduce. This has resulted in a reduction of local Blanding’s turtle populations. Since 1984, Blanding’s turtles have been classified as a threatened species in Minnesota, making it illegal to possess, sell, harm or harass the turtles. Last week, Pinellas County, on Florida’s west coast, voted to stop adding fluoride to its public water supply after starting the program seven years ago. The county joins about 200 jurisdictions from Georgia to Alaska that have chosen to end the practice in the last four years, motivated both by tight budgets and by skepticism about its benefits. Eleven small cities or towns have opted out of fluoridating their water this year, including Fairbanks, Alaska, which acted after much deliberation and a comprehensive evaluation by a panel of scientists, doctors and dentists. The panel concluded that in Fairbanks, which has relatively high concentrations of naturally occurring fluoride, the extra dose no longer provided the help it once did and may, in fact, be harmful. Biologists at the Minnesota Department of Natural Resources are concerned zebra mussels may be hitchhiking on boat lifts. The DNR says a second case recently was discovered on the northeast corner of Lake Irene in Douglas County. A localized population of zebra mussels was found on a lift. A similar case was discovered at Rose Lake in Otter Tail County in late September. At Lake Irene, the DNR was called in to investigate zebra mussels found on a boat lift recently removed from the water. The DNR suspects the pests were transported to the lake this summer when the boat lift was moved in from an infested lake. The DNR plans to treat the small area with copper sulfate, used to treat snails that cause swimmers itch. The Minnesota Department of Natural Resources has updated its website to show the additional lakes and sections of rivers that were designated as waters infested with invasive species during the summer and fall. Faucet snails: Two lakes – First Crow Wing and Second Crow Wing — and an additional portion of the Crow Wing River in Hubbard County were designated as infested because of the presence of faucet snails. The snail has been linked to waterfowl deaths at Lake Winnibigoshish, Bowstring Lake and the Mississippi River in southeastern Minnesota. Spiny waterfleas: Two waters were added in the vicinity of Lake of the Woods because spiny waterfleas are present. Spiny waterfleas can spread when boats, fishing or bait harvesting gear become contaminated with egg-laden females or when water from the infested lakes and rivers is transported. They can collect in masses, sticking to fishing lines, downrigger cables and anchor lines. The masses can resemble gelatin or cotton batting with tiny black spots, which are the creatures’ eyes or eggs. View the list of infested waters. Whooping crane chicks have definite personalities. Chick L10 was shy but blossomed into a rascal, and Chick L8 had an early tendency toward being a bit of a bully, but eventually learned to get along with his peers. Whooping crane Chick L8 was hatched on June 4, 2010. When he was about a month old, he became a “meanie” toward other chicks and could not be walked with any other cranes. He had to live and exercise by himself for a long time and was the last bird to be socialized with the rest of his cohorts. But it turns out that Chick L8 was just a late bloomer, and he eventually learned to live peaceably with others. Chick L8 has a sister, who was also released in Louisiana. Both of these gangly, adolescent whooping cranes were shot and killed in Louisiana on Monday, October 10, 2011, and though two alleged shooters have been identified, the world of whooping crane scientists, managers, caretakers, volunteers, and birders is in mourning — once again. Tragically, these are the sixth and seventh shooting deaths of reintroduced endangered U.S. whooping cranes in 2011. “You couldn’t get the votes in the House to raise revenue for anything last session,” Ritter said. Since 1996, when lawmakers mandated statewide water planning, Texans haven’t agreed on how to pay for needed work. This year, as crops withered and cattle went to early slaughter, pressure rose for action to protect the economy and sustain a surging population. Perry called on citizens to pray for rain six months after the drought began. On Nov. 8, voters will decide on letting the state carry as much as $6 billion in water-related debt. It’s been more than five years since Al Gore’s documentary, “An Inconvenient Truth,” put global warming at the forefront of the national debate. And the former vice president’s passion for the subject appears intact. Gore arrived on the Wayne State University campus and delivered a rousing address tying the fight to combat climate change to other environmental issues — particularly, efforts to help the Great Lakes region rebound from decades of industrial pollution. If anything, the intensity of Gore’s arguments might have increased in recent years. As an example, Gore drew a parallel between high levels of phosphorous scientists believe are pouring into the Great Lakes and resulting in harmful algal blooms with the carbon emissions believed to be affecting the ozone layer. The Metropolitan Council is considering legal action against 3M Co. after state regulators said the agency may have to spend millions of dollars on wastewater treatment plants to clean up a toxic pollutant connected to the corporation’s manufacturing sites. The development brings yet another player into the decades-long battle over perfluorochemical (PFC) contamination in the Mississippi River and groundwater in the east metro area, which already has cost 3M millions of dollars in cleanup and remediation. PFCs are industrial compounds widely used in the manufacture of household products, but which are viewed as an emerging environmental health concern. In high concentrations the compounds are toxic, especially the one at issue in the Met Council’s plants, known as perfluorooctane sulfanate or PFOS. 3M stopped using the compounds in 2002, but last year the Minnesota attorney general filed suit against the company after 3M and the state were unable to reach agreement on future cleanup costs and water treatment related to many years of contamination in the east metro area. Now, the council is considering joining in that lawsuit, as the city of Lake Elmo did after it was filed. Five health and environmental groups sued the Obama administration over its rejection of a proposed stricter new standard for ozone pollution, saying the decision was driven by politics and ignored public health concerns. The groups said that President Obama’s refusal to adopt the new standard was illegal and left in place an inadequate air quality rule from the Bush administration. Near the end of his presidency, George W. Bush overruled the Environmental Protection Agency’s scientific advisory panel and set the permissible ozone exposure at 75 parts per billion. The current E.P.A. administrator, Lisa P. Jackson, wanted to set the standard at 70 parts per billion, near the maximum level recommended by the advisory panel. But President Obama rejected that proposal on Sept. 2, saying that compliance would be too costly and create too much regulatory uncertainty for industry. He ordered the E.P.A. to conduct further scientific studies and come up with a new proposal in 2013. The Department of Natural Resources said it will reconsider a key permit for a large dairy farm proposed in Adams County after the agency received an analysis by a University of Wisconsin-Stevens Point hydrogeologist who concluded the farm is likely to reduce local water supplies. The DNR had made a preliminary determination that groundwater pumping by the 4,200-cow Richfield Dairy would not harm local conditions. And a spokesman for the company developing the farm also emphasized that the pumping of more than 50 million gallons of water annually won’t be more than the irrigation now used for potatoes on the same land. The Richfield Dairy is being developed by Kaukauna-based Milk Source, which owns the state’s largest dairy farm, Rosendale Dairy, in Fond du Lac County. It operates two other farms and a third is slated to open early next year. If Richfield Dairy is constructed, Milk Source will own five dairy farms with about 26,500 cows, according to the company. In addition, it owns a separate 9,200-calf operation near De Pere. At Richfield Dairy, the company needs DNR permits for a high-capacity well and wastewater discharge, along with an environmental assessment of the project. Approvals on all three are pending, according to the DNR. The DNR said it is reconsidering the permit for the high-capacity well after George Kraft of UW-Stevens Point said the farm would harm local water bodies and draw down the aquifer. More than 20 people who live within the outline of a proposed Water Management District in the Heron Lake Watershed provided comment to members of the Minnesota Board of Water and Soil Resources regarding additional fees they could be assessed if a WMD plan is approved. The nearly two-hour public hearing at times grew heated as people expressed their displeasure at “another tax,” and the prospect of a plan being implemented by an HLWD board consisting of five appointed, rather than elected, members. Most of the approximately 75 people in attendance were residents of Jackson County, where county commissioners voted against the WMD plan earlier this year. Both the Nobles and Murray county boards of commissioners approved the proposal in July. The second largest discount retailer in the U.S. announced that it will sell only sustainable, traceable fish by 2015. Minneapolis-based Target Corp. operates 1,762 stores, many of which are converting to incorporate PFresh markets that sell fresh and frozen foods, including fish. In 2010, Target stopped selling farmed salmon, Chilean sea bass and orange roughy due to various sustainability issues. It currently sells 50 different brands of fish certified by either the Marine Stewardship Council or the Global Aquaculture Alliance. “We thought this larger commitment to fully eliminate anything that’s not certified by 2015 would be the right thing to do to encourage our guests to make the right decisions,” said Shawn Gensch, vice president of marketing for Target’s sustainability initiatives. Target is partnering with the nonprofit marine conservation group FishWise to reach its sustainability goals. According to FishWise executive director Tobias Aguirre, the group will assess all Target seafood products with vendor surveys to understand how the seafood is caught or farmed and will evaluate the environmental impacts associated with each product. The 50,000 drivers who cruise daily along Interstate 25 between Denver and Colorado Springs drive through ranch and farm land marked by dramatic buttes and the presence of wild animals, a vista that might have been very different but for a little-known federal program. The Land and Water Conservation Fund, which Congress created in 1965, helped pay for this open space, along with large swaths of land in other areas across the country. But there is a fight looming in Washington as Congress plans to drastically cut the program’s budget, and President Obama, who had accepted cuts in the past, appears ready to oppose them. The fund is supposed to receive $900 million each fiscal year out of U.S. offshore oil and gas revenue to pay for federal land acquisitions. But with the exception of fiscal 1998, its funding has consistently fallen well short of that mark. The 2011 operating plan provided $300.5 million, and although Obama asked for $900 million for fiscal 2012, the pending House appropriations bill for Interior allocates just under $95 million. A Republican amendment targeting the Environmental Protection Agency’s nonexistent farm dust regulations laid the groundwork for a surprising, and possibly precedent-setting, parliamentary maneuver from Senate Majority Leader Harry Reid. The question now, is how do Reid and Democrats — particularly Midwesterners up for reelection next year — deal with the amendment the next time it comes up? After all, congressional Republicans have made their push to label EPA regulations as job killers a centerpiece in their fight against the jobs strategies from President Barack Obama and Democratic leaders. Reid moved to stop the GOP’s ability to offer motions allowing for amendments to be offered to a bill even after a filibuster has already been defeated if two-thirds of senators allow. Republicans contend Reid made his move because there was a good chance the 67 votes were there for Johanns’s amendment. Nicole Meyer has her free time mapped out for the next 27 years. That’s how long she estimates it will take her to reach her goal of designing a logo a day for every lake in Minnesota. A Wisconsin native who fell in love with the state while attending the University of Minnesota, Meyer started the project as a way of reconnecting with the area while working at an advertising agency in Arizona. Now back in Minneapolis, she’s determined to keep it going. Every day, she picks a lake, researches it, designs its logo and posts it on the web site. Lake associations have expressed interest in buying the rights to the logos of their lakes for T-shirts or signs, and Meyer is considering their offers. But the point of this has never been to make money, she insisted. The Minnehaha Creek Watershed District is honoring a company, a state agency, several nonprofit organizations and several individuals as Watershed Heroes for protecting water resources. Solution Blue Inc., a St. Paul firm that specializes in sustainable design. — Minnesota Department of Veterans Affairs, which underground storm water holding tanks and a water-pervious driveway and parking lot at the Minneapolis Veterans Home. — Minnesota Waters, a statewide non-profit organization that has taken a leadership role in confronting aquatic invasive species. — Youth of Pierson Lake Association, a youth organization that caught and removed about 35,000 pounds of carp from Pierson Lake. — Lake Action Alliance, a coalition of the Christmas Lake Homeowners Association, the Lake Minnewashta Preservation Association and the Lotus Lake Association that has worked to protect its lakes and others against zebra mussels. — Bob and Jan Halverson, who sold their 112-acre farm in Minnetrista to the watershed district for less than its appraised value as a gift to the community. The district plans to conserve most of the land to protect Halsted Bay on Lake Minnetonka’s Halsted Bay. You are reading this blog. You may look for it each week. Or you may have happened on it through a search-engine query. But, if you like the information about water and the environment you find here, subscribe to the blog so you can read it regularly. We have a new, easier-to-use RSS feature. Click on the RSS icon, at right, and follow the directions to get the blog delivered to your browser or email inbox. Then please let us know what you think of the blog and how you use it. Send comments to psweeney@freshwater.org. The new national strategy for cleaning up the Chesapeake Bay is better than the one used over the past 30 years, but is lacking in science, accounting and fairness, a study by the National Academy of Sciences concludes. The study is depicted as an independent review of a blueprint pushed by the Obama administration to put the Bay on a “pollution diet” over the next 15 years and restore healthy water quality after 2025. Supporters and critics of the Obama initiative found something to like in the report, prepared by nine scientists from across the country, including one from the University of Virginia. Supporters latched onto its bottom-line message: A federally led strategy to cut the Bay’s three most troubling pollutants – nitrogen, phosphorus and sediment – through two-year progress reports and detailed cleanup plans from six states and the District of Columbia is more likely to succeed than the old system of politically expedient promises and little transparency. The Chesapeake Bay Foundation said the report shows that, after decades of empty pledges and missed deadlines, government overseers finally are on the right track. Critics said they were heartened to see some of their concerns validated in print, including a reliance on incomplete computer models and a system of analyzing data that “cannot on the whole be viewed as accurate,” according to the report. For example, in determining if farms are reducing polluted runoff, the report notes how farmers who took action on their own and without government money were not counted as helping the Bay in computer models. The report also points out that “nearly all states have insufficient information to evaluate their progress in reducing nutrient pollution,” and that few states even check to see if farm or stormwater improvements are actually working. Federal pollution authorities have quietly stepped in to help Minnesota force a huge sugar beet processor near Renville to end its long history of fouling streams that lead to the state’s most troubled river. Southern Minnesota Sugar Beet Cooperative has tangled repeatedly with the state Pollution Control Agency over its processing plant near the Minnesota River, and it has been fined numerous times in the past 15 years for air and water quality violations. Now, in an unusual step, the U.S. Environmental Protection Agency has taken the lead on legal action against the farmer-owned co-op and has initiated a discussion with executives about what it will take to address its chronic problems. Co-op officials did not respond to requests for an interview for this story. Taken one by one, the plant’s violations are not egregious, state officials said. But their ongoing nature, environmental advocates say, illustrates the limits of the state’s ability to enforce state and federal air and water quality laws. A debate simmering since the 1978 Boundary Waters Canoe Area Wilderness Act was passed by Congress has quietly ended with a formal decision by the U.S. Forest Service that favors conservation groups. Jim Sanders, supervisor of the Superior National Forest, which includes the BWCAW, recently rendered a decision that will keep the number of motorboat permits on three chains of lakes in the Ely and Gunflint Trail areas at low levels. Local home and cabin owners on the Moose-Newfound-Sucker, Birch-Farm and Saganaga-Gull Lake-Sea Gull River chains of lakes, along with the Forest Service, had sought increased motor permits for the lakes to offer easier access for property owners. The lakes are adjacent to the federal wilderness. But a series of challenges and lawsuits from 1999 to 2006 by conservation groups opposed the increase, saying the landowners should be required to compete with everyone else who wants a day-use permit to operate a motorboat on the chain of lakes. It’s an essential truth that too few Minnesotans contemplate as they gaze over the state’s rolling fields or across their landscaped back yards. Human development has radically altered the state’s landscape. Native prairie has been plowed under and paved over, wetlands misguidedly filled in. Beneath it all are vast networks of drainage tile to quickly move rainwater off the land. All of this was done with good intentions. Minnesota’s rich soil has helped feed the world and now, through ethanol, is helping fuel it. The growing communities derided by some as sprawl are home to the citizens who come here or stay here because of the high quality of life. There is, however, a high price to be paid for this undeniable change in land use, as a newly finalized state plan to clean up a 64-mile stretch of the Mississippi River makes abundantly clear. Authorities in Wisconsin will release an invasive species this month to kill another invasive species. More than 1,000 tiny stingless wasps the size of a grain of rice will be let go at Riveredge Nature Center in the Town of Saukville later in May in the hope that they destroy another insect – the highly destructive emerald ash borer. This is the first time Wisconsin has experimented with the wasps to kill emerald ash borers, and it will become the 10th state to experiment with the insect. Officials in Wisconsin said that the wasps present no threat to the public. The emerald ash borer was first detected in 2008 in nearby Newburg on the Ozaukee-Washington county line. Since then, they have been found in Cudahy, Franklin, Oak Creek, Green Bay, Kenosha and Victory in Vernon County. Wisconsin has an estimated 700 million ash trees. Mesabi Nugget Delaware, LLC and Steel Dynamics, Inc. recently agreed to pay a $12,500 civil penalty to the Minnesota Pollution Control Agency for alleged water quality permit violations at their iron nugget production facility in Hoyt Lakes, Minn. The permittees have since fulfilled all of the settlement’s required corrective actions. In 2005, the Mesabi Nugget/Steel Dynamic Hoyt Lakes facility received a National Pollutant Discharge Elimination System/State Disposal System permit that authorizes treated wastewater discharge to state surface waters. The facility uses water for a variety of purposes, including cooling and air emissions control. Prior to discharge, treated wastewater must meet specific effluent limits. The MPCA alleges that Mesabi Nugget did not meet the permit’s effluent limits, effluent volume restrictions and various reporting requirements. For a comprehensive list of enforcement actions by the MPCA, visit the agency’s website at www.pca.state.mn.us/newscenter/enforcement.html. A ripple spreads when a bobber plops in calm water. Waves of economic impact roll over Minnesota when all its anglers do the same. These figures, Peterson said, are based on a 2007 study that analyzed the economic impact of the nation’s 39 million licensed anglers, including 1.4 million in Minnesota. Global sea levels will rise faster than expected this century, partly because of quickening climate change in the Arctic and a thaw of Greenland’s ice, an international report said. The rise would add to threats to coasts from Bangladesh to Florida, low-lying Pacific islands and cities from London to Shanghai. It would also raise the cost of building tsunami barriers in Japan. Record temperatures in the Arctic will add to factors raising world sea levels by up to 5.2 feet by 2100, according to a report by the Oslo-based Arctic Monitoring and Assessment Programme (AMAP), which is backed by the eight-nation Arctic Council. “The past six years [until 2010] have been the warmest period ever recorded in the Arctic,” the report said. “In the future, global sea level is projected to rise by 0.9 metres [3 feet] to 1.6 metres [5.2 feet] by 2100 and the loss of ice from Arctic glaciers, ice caps and the Greenland ice sheet will make a substantial contribution,” it added. The population of the world, long expected to stabilize just above 9 billion in the middle of the century, will instead keep growing and may hit 10.1 billion by the year 2100, the United Nations projected in a report. Fish taken in 2010 from nine of Minnesota’s 10 largest walleye lakes had levels of perfluorooctane sulfonate (PFOS) that were either very low or undetectable, suggesting those lakes have very little or no contamination from perfluorochemicals (PFCs). That is one of the early findings from new data for fish contamination recently received by the Minnesota departments of Health, the Minnesota Department of Natural Resources and the Minnesota Pollution Control Agency. The results of the PFC testing mean that advice on how much fish can be eaten safely from those walleye lakes will not be impacted by perfluorochemicals. That’s good news for Minnesotans who like to catch and eat fish from those waters, said Pat McCann, MDH fish advisory program manager. The walleye lakes tested were Kabetogama, Rainy, Vermilion, Mille Lacs, Lake of the Woods, Leech, Winnibigoshish, Cass and Upper Red Lake. The 10th largest walleye lake is Lake Pepin, part of the Mississippi River, which had been previously tested and had levels of PFCs that led to recommendations to limit consumption for some species. Perfluorochemicals are a family of man-made chemicals that have been used for decades to make products that resist heat, oil, stains, grease and water. For more background on perfluorochemicals in Minnesota, go to: http://www.health.state.mn.us/divs/eh/hazardous/topics/pfcshealth.html. The University of Minnesota finalized an agreement with Upstream Technologies, a Minneapolis startup company that aims to commercialize a device that will improve sediment control for urban storm water. The device was developed at the Saint Anthony Falls Laboratory, a research unit within the university’s College of Science and Engineering. Researchers nicknamed the device the “SAFL Baffle” and are finding it to be a cost-effective method for preventing harmful sediments carried by storm water from reaching Minnesota lakes and streams. As water makes its way into storm sewers after a rainstorm, and eventually into lakes and rivers, it picks up sediments like sand and gravel along the way. These sediments sometimes contain nutrients that can interrupt the biological balance of lakes and streams and can be harmful to plant life. The SAFL Baffle is installed in a sump — a vertical cylinder that connects two or more sewer pipes. There are usually 30 to 40 sumps in the sewer system on a given street. The Baffle slows down water rushing into the sump and prevents it from picking up sediments that have settled there during low-flow periods. With no end in sight to Chicago’s chronic water pollution problems, environmental groups filed a lawsuit seeking to stop the routine dumping of human and industrial waste into the Chicago River and Lake Michigan. The 12-page complaint, filed in U.S. District Court, is the latest salvo in a long-running dispute about the river, which engineers reversed away from Lake Michigan at the beginning of the last century to block Chicago’s sewage from flowing into its source of drinking water. Environmental groups accuse the Metropolitan Water Reclamation District of repeatedly violating the federal Clean Water Act by allowing sewage to pour out of overflow pipes during rainstorms. During the most intense downpours, district officials open locks separating the Chicago River from Lake Michigan and allow a noxious mix of runoff and disease-causing waste to flow into the lake. The groups are asking for a court order to stop the district from dumping sewage into area waterways immediately, but the lawsuit does not specify how that should happen. A rogue bighead carp was pulled from the Lower St. Croix River , adding to fears the invasive creatures are slowly working their way into Minnesota border waters. A commercial fisherman netting for buffalo and common carp caught the 27-pound fish just north of the St. Croix’s confluence with the Mississippi River and contacted the Minnesota Department of Natural Resources, agency officials said. 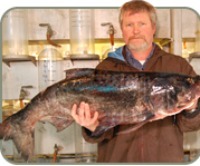 It was the seventh bighead carp found in eastern border waters since 1996 but the sixth since 2003. DNR officials stressed the fish appears to be a loner that swam north and there’s no indication yet of a reproducing population in Minnesota portions of the Mississippi or St. Croix rivers. “Large migratory river fish — that’s what they do … they migrate,” said Brad Parsons, DNR central region fisheries manager. “It’s alarming, but it’s one fish,” added DNR communications director Chris Niskanen. Bighead and silver carp, another type of Asian carp noted for its leaping abilities, have been on the agency’s radar for years because of the threat they pose to the state’s $2.7 billion fishing industry. Imported from Asia four decades ago to control algae and other problems in Southern fish farms, they eventually escaped or were released into the wild and have been slowly making their way up the Mississippi and Missouri rivers to southeastern Minnesota and South Dakota. They consume huge amounts of tiny plankton, upsetting the food chain and pushing out native fish, eventually making up 90 percent of some area’s fish biomass. A 27-pound bighead carp’s journey up the Mississippi River might have been eased by floodwaters, a Minnesota Department of Natural Resources expert said. Luke Skinner, invasive species supervisor for the DNR, said the fish a commercial fisherman caught in the St. Croix River might have used high water to find its way to where the two rivers merge. The DNR is concerned about the invasive fish disrupting Minnesota’s river ecosystems. “It is cause for alarm because now we’re finding something pretty high up in the river, and we just don’t have a lot of ways to slow their spread, especially big river systems like this that are prone to flooding,” Skinner told MPR’s Morning Edition. All the locks, dams and gates are open this spring to allow high water to flow through, Skinner said. But even when the locks are closed, fish can get in. Skinner said there needs to be more fish barriers that would prevent invasive fish species from spreading. Listen to an MPR question-and-answer interview with Skinner. The Minnesota Pollution Control Agency has announced that Highwater Ethanol in Lamberton has agreed to pay a $150,000 penalty to resolve alleged violations of the company’s MPCA-issued environmental permits at its production facility. The agreement covers violations that have occurred since the facility began production in August 2009. From startup until recently, the company’s operations have resulted in numerous violations of the facility’s air quality and water quality permits. The most serious violations involved the facility’s wastewater-treatment system. Part of the system includes an on-site constructed pond which is permitted to receive only reject water from the reverse osmosis treatment system, yet unpermitted discharges were made to the pond repeatedly from other components of the facility. This caused the capacity of the pond to be exceeded. To get rid of the excess the company applied wastewater from the pond onto cropland, a treatment method for which the facility is not permitted. There were also a number of violations of the facility’s air quality permit, including failure to conduct monitoring at required intervals, maintain required operating parameters, maintain monitoring records, and submit required data to the MPCA. Faced with epic floods in the late 1960s, dozens of communities across Minnesota hurriedly shaped dirt, clay, sand, gravel or whatever else was available into temporary walls to hold off the floodwaters. In most cases, those levees were supposed to be removed once the water receded. But more than 40 years later, ”emergency” levees remain the primary line of defense against floods, protecting hundreds of homes and businesses in numerous towns and cities. In an era of rising water and falling budgets, officials are viewing them with both thankfulness and nervousness. President Barack Obama acknowledged concerns about natural gas drilling and groundwater contamination as part of a wide-ranging monologue on energy production at a town hall meeting. Obama has said natural gas should be part of a “clean energy standard” going forward but noted concerns about pollution. Although he didn’t mention hydraulic fracturing by name, the practice that has allowed new gas plays in the U.S. is increasingly controversial because of alleged links to groundwater contamination. “We have a lot of natural gas here in this country,” Obama said. “The problem is, is that extracting it from the ground — the technologies aren’t as developed as we’d like and so there are some concerns that it might create pollution in our groundwater, for example. “So we’ve got to make sure that if we’re going to do it, we do it in a way that doesn’t poison people,” he added. Gov. Martin O’Malley created a task force to figure out how to curb pollution of the Chesapeake Bay from septic systems, saying he hoped the study would help overcome “fears” of the legislation he had introduced this year that would have banned major housing developments relying on them. “We must find a way to grow in a clean, green, more sustainable way,” O’Malley said prior to signing an executive order establishing the task force. He held the signing ceremony at the Arlington Echo Outdoor Education Center on the Severn River, where household septic systems account for roughly 30 percent of the nitrogen fouling the water. Currently, about 411,000 Maryland households are on septic systems. Although a relatively small source of nitrogen pollution baywide compared with sewage plants or farm runoff, septic leakage of the harmful nutrient could increase by 36 percent over the next 25 years if nothing is done, state officials project. O’Malley’s bid to curb major housing developments on septic systems failed to get out of committee in Annapolis after rural lawmakers, farmers and developers raised an outcry, warning that it would throttle growth and cost jobs in the state’s rural and suburban counties. The day after the Florida House passed a bill to ban implementation of water quality standards set by the U.S. Environmental Protection Administration, Gov. Rick Scott asked the agency to rescind a January 2009 determination that the federal rules are necessary for Florida. Opponents of the federal requirement say the state is better equipped to decide how best to comply with the federal Clean Water Act, which is intended to manage nitrogen and phosphorous pollution of lakes, rivers, streams and bays. They say the EPA standards will be costly to implement, don’t address specific conditions of local waterways and provide little biological benefit. According to Scott’s office, the petition sent to the EPA details eight pollution control measures already in place Florida that mirror EPA recommendations for effective water pollution control. The U.S. EPA released pollution standards for Florida waterways in December 2010 as part of a 2009 legal settlement with environmental groups, including the Sierra Club, who sued the agency for not enforcing the Clean Water Act in Florida. Merriam’s column was published in Freshwater’s April Facets newsletter and re-printed on the Minnpost web site. Read it either place. The newsletter also has articles on Craig A. Cox’s prescription for “Taking the Pollution out of Agricultural Production” and a q-and-a interview with Pamela Shubat, director of the Minnesota Health Department’s Contaminants of Emerging Concern program. The Freshwater Society will host an Ice Out/Loon In party and fund-raiser April 21 in Excelsior. The event is keyed to two signs of spring: Ice-out on Lake Minnetonka and the frequent stop-overs of migrating loons on the lake. The party, from 5:30 to 8:30 p.m., will feature food, drink, bluegrass music, a raffle and silent auction, and presentations on loons and ice-out on the lake. If you think you are up to it, join the loon-calling contest. Visit the Freshwater web site for information and registration. A public open house on a draft clean-up plan for the Mississippi River in the south metro area will be held from 3:30 to 7:30 p.m. on Wednesday, May 4. The open house will be at the Merriam Park Library, 1831 Marshall Ave., St. Paul. The open house is sponsored by the Friends of the Mississippi River, the Mississippi National River & Recreation Area and the Minnesota Pollution Control Agency. The Mississippi, from its confluence with the Minnesota River in St. Paul to Red Wing, currently fails to meet basic health standards because of excess sediment in the water. People attending the open house attendees will learn about a Total Maximum Daily Load plan prepared by the Minnesota Pollution Control Agency that spells out maximum levels of pollution that the river can accept and still offer a clean and healthy environment for humans, animals, fish and plants. At the open house, there will be two presentations on the plan – at 4 p.m. and 6:30 p.m. – and each will be followed by a question-and-answer session with a panel of water quality and restoration experts. To learn more about the South Metro Mississippi Turbidity TMDL, visit the MPCA’s Mississippi River TMDL web page. For more information about the open house, contact Trevor Russell at 651-222-2193 x18 or Lark Weller at 651-290-3030 x304. Amy Vedder, a renowned gorilla researcher and conservationist, will deliver three public lectures – in St. Paul, Duluth and Ely – on April 19 and 20 in the 2011 Sigurd Olson Lecture Series. The series is sponsored by Vermilion Community College and the Friends of the Boundary Water Wilderness. Vedder, the senior vice president of the Wildlife Conservation Society, is the author of In the Kingdom of Gorillas, which describes her effort to study and protect mountain gorillas in Rwanda. At 3 p.m. Tuesday, April 19, in Room 203 of Green Hall on the University of Minnesota’s St. Paul campus. At noon on Wednesday, April 20, in the fourth-floor library rotunda at the University of Minnesota Duluth. At 7 p.m. Wednesday, April 20, in the auditorium of Vermilion Community College. A West Texas tycoon who shopped valuable water across the state for more than a decade has settled for selling to his neighbor. Lubbock and 10 Panhandle cities have a purchase agreement for thousands of acres of water rights owned by famed corporate raider T. Boone Pickens, potentially solidifying the group as the state’s largest holder of groundwater rights and closing a combative and fascinating chapter in water marketing in Texas. The Canadian River Municipal Water Authority confirmed the purchase of water rights beneath 211,000 acres in seven counties north of Amarillo for $103 million, increasing its groundwater holdings by 80 percent and an estimated 4 trillion gallons. The sale is expected to close in July or August, based on a statement from the authority. The U.S. Army Corps of Engineers said it activated a new electric fish barrier on the Chicago Sanitary and Ship Canal near Romeoville designed to keep Asian carp from migrating to Lake Michigan. It was completed a year ahead of schedule, the corps said. Because of the electric discharge, the corps warned boaters to use “extreme caution” while traveling between river mile markers 296.1 and 296.7. It is dangerous to enter the water or place hands or feet in the water for any reason, the agency said. Last month, federal officials said that lab testing found the Sanitary and Ship Canal’s electric dispersal barriers were effective for fish 5.4 inches or longer. Higher electric power levels might be needed to immobilize small Asian carp about 2 to 3 inches long, they said. The smaller fish are not believed to be close to the barriers, which are near Lockport. Chicago is leaning on the U.S. Army Corps of Engineers to fast-track an ongoing study to protect Chicago’s Lake Michigan shoreline – and the rest of the Great Lakes – from an Asian carp invasion. It is an ironic twist of history, considering that Chicago sparked the problem over 111 years ago when it obliterated the natural barrier between the Mississippi River basin and Lake Michigan by constructing the Chicago Sanitary and Ship Canal. The canal remains the linchpin in the Windy City’s giant plumbing system that flushes waste away from its Lake Michigan drinking water intake pipes, down the Mississippi and into the Gulf of Mexico. The canal, which reversed the flow of the Chicago River so it flowed out of Lake Michigan instead of into it, was built to send about 6 billion gallons of Lake Michigan water per day into the Mississippi basin, though a Supreme Court ruling has capped that amount at about 2 billion gallons per day. When it comes to recycling bottles and cans, Minnesota pales in comparison with Iowa. Here, 35 percent of them are recycled; the rest are lost or tossed. But south of the border, where a beverage container deposit law is in place, 86 percent, or 1.65 billion every year, are recycled. Minnesota would adopt a similar approach under a bill she and Sen. Katie Sieben, DFL-Newport, plan to introduce. Their proposal would attach a 10-cent deposit on most bottles and cans containing beverages such as soft drinks and beer. Consumers would get their money back when they turn in the empty containers. By putting value on bottles and cans, people would be much more likely to return them, keeping them out of ditches or other parts of the waste stream, Hortman said. And because there always would be fewer containers returned than bought, there would be unclaimed refunds that the state could use to offset budget problems, she said. Gov. Scott Walker has apparently backed off his plan to repeal a rule passed last year that sets limits in Wisconsin lakes and streams for phosphorus, a nutrient from fertilizers which causes weed and algae growth. Instead, Walker has proposed that the new rule not be put in place for two years, according to Cathy Stepp, secretary of the state Department of Natural Resources. Stepp testified on the proposal, and other conservation-related items in the budget, before the state Legislature’s Joint Finance Committee. The Legislature is poised to give the Department of Natural Resources new authority to require boat inspections and decontamination to slow the spread of zebra mussels. And that means Minnesotans could see some changes at boat landings this summer when they go out to visit their favorite lakes. But there is disagreement about how effective these efforts could be. Zebra mussels hitchhike from lake to lake on boats and trailers. They can clog water intakes and boat motors, leave sharp shells on beaches, and, in high numbers, they can alter the food chain. Minnesota now has 19 lakes and four rivers infested with zebra mussels — including Mille Lacs Lake, the state’s best-known walleye fishery, and popular Lake Minnetonka. For decades, scientists have warned that humans may be ushering in a sixth mass extinction, and recently a group of scientists at the University of California, Berkeley, tested the hypothesis. They applied new statistical methods to a new generation of fossil databases. As they reported last month in the journal Nature, the current rate of extinctions is far above normal. If endangered species continue to disappear, we will indeed experience a sixth extinction, over just the next few centuries or millennia. The Berkeley scientists warn that their new study may actually grossly underestimate how many species could disappear. So far, humans have pushed species toward extinctions through means like hunting, overfishing and deforestation. Global warming, on the other hand, is only starting to make itself felt in l the natural world. Many scientists expect that as the planet’s temperature rises, global warming could add even more devastation. “The current rate and magnitude of climate change are faster and more severe than many species have experienced in their evolutionary history,” said Anthony Barnosky, the lead author of the Nature study. They call Port Arthur gasoline alley, cancer alley, and the armpit of Texas. For most of his life, Hilton Kelley has called it home. The city has had the same distinctive odor since he was a boy, Kelley said. Adults jokingly called it the smell of money, because the nearby oil refineries and petrochemical plants did most of the hiring. But after the cancer rate grew, the childhood asthma rate rose and the population plummeted, Kelley, now 50, stopped laughing. Kelley’s decade-long fight to lower the city’s air pollution earned him this year’s Goldman Environmental Prize for the North America category, being awarded Monday in San Francisco. The annual prize and a $150,000 stipend is routinely awarded to six grass-roots environmentalists from different parts of the world. Since the award was established in 1990, a total of $13.2 million has been awarded to 139 recipients from 79 countries, as of 2010, according to a spokeswoman. Farmers in California’s agricultural heartland, which also is home to some of America’s most contaminated aquifers, may soon have to start monitoring and cleaning up groundwater. But the proposal being considered by the Central Valley Regional Water Quality Control Board in Rancho Cordova has generated frustration on all sides. Farmers say the new regulations affecting 35,000 famers and 7 million acres of irrigated land are an expensive, bureaucratic burden. And environmental groups say the rules are not strong enough to protect drinking water from the threat of fertilizers and other agricultural runoff. The new long-term rules would cover not only ground water but also surface water, which has been regulated on an interim basis since 2003. University and local government studies have found that nitrate levels harmful to human health have increased dramatically in drinking water supplies in past decades. A report last month by the Oakland-based Pacific Institute concluded more than 1 million San Joaquin Valley residents—a third of the Valley’s population—are exposed to drinking water tainted with fertilizer and other toxins. U.S. water utilities have known about the prevalence of a likely carcinogen in water sources for seven years and have failed to share that information with the public, according to an advocacy group, which released a 2004 industry study of hexavalent chromium. The American Water Works Association Research Foundation study focused on hexavalent chromium in groundwater sources nationwide. The AWWA report was obtained and released by the nonprofit Environmental Working Group. The 124-page report features data from tests on 341 water samples from 189 water utilities in 41 states. About two-thirds of those samples came from groundwater sources, while another third came from surface sources. The report found hexavalent chromium nationwide, particularly in groundwater. The highest levels were found in California. The study emphasizes that the “majority of the hexavalent chromium results were found to be less than” the current U.S. EPA Method Detection Limit. But it also concluded that conventional filtering systems used by water utilities in 2004 were typically ineffective in addressing hexavalent chromium. The recent disasters in Japan may be driving increased resolve to plan for biological invasions of species, a crisis that can be as costly as natural disasters. The report by three biologists from McGill University in Montreal contends that biological invasions may be more damaging economically than natural disasters. Their proposal is simple: because biological invasions are similar to natural disasters, they require similar management strategies that are not currently in place in any nation. This includes safety codes and standards, emergency preparedness and rapid-response measures similar to those in place for earthquakes, hurricanes, and tsunamis. What is more important to you: The economy or the environment? I you are reading this blog, you may choose the environment. But a recent Gallup poll showed most Americans chose economic development. Fifty-four percent of Americans gave a higher priority to economic growth than to protecting the environment, according to results of the poll. Thirty-six percent attached more priority to environmental protection. Since Gallup started asking the economy vs. environment question in 1984, Americans have generally favored the environment. The poll was conducted in early March, before an earthquake and tsunami in Japan caused the failure of several nuclear reactors. In a 2000 Gallup survey, Americans favored the environment over the economy, 67 percent to 28 percent. A bill that would water down Minnesota’s wild rice pollution rules passed the House and Senate in a vote that reflects a fundamental shift in environmental philosophy at a Legislature now controlled by Republicans. The zeal to change the wild rice water quality standard is driven in part by the allure of a resurgence of Minnesota’s mining industry on the Iron Range. Supporters say the current standard imposes a heavy burden on business, and they are unwilling to wait for ongoing research to provide better guidance. “It does not make sense for major expenditures of capital to be made to comply with a standard that we know is subject to change in the near term,” said Mike Robertson, an environmental consultant for the Minnesota Chamber of Commerce. But environmentalists charge that the bill, which dictates a fivefold increase in sulfate limits for wild rice, is just one example of a Republican preference for business interests over both clean water and environmental science. In what has become a biennial ritual of the deficit years, lawmakers are running their fingers through every pot of dedicated state money within reach as they labor to erase a multibillion-dollar deficit. But in 2011, most of the easy pickings have long since been taken – starting with $1 billion in tobacco lawsuit proceeds appropriated by Gov. Tim Pawlenty and the Legislature to help with a $4.3 billion deficit in 2003 – and legislators have already laid claim to roughly half of the $108 million in one of the few sizable dedicated funds still left intact, the Iron Range-specific Douglas J. Johnson Economic Protection Trust Fund. But the most coveted, and most closely guarded, stash of all is the roughly $540 million in revenue from the 2008 Legacy sales tax amendment. Arts and environment advocates are already crying foul over lawmakers’ efforts to skirt the constitutional strictures governing Legacy spending. “It looks like there’s huge potential to do that, and I cannot see how you can legitimately spend the Legacy money in the way it has been proposed,” said Rep. Jean Wagenius, the environment minority lead on the House Environment, Energy and Natural Resources Committee. A massive fish kill last month in the Milwaukee harbor has been linked to a deadly fish virus that was first discovered in Lake Michigan in 2007. The Wisconsin Department of Natural Resources reports it is the first time the disease known as viral hemorrhagic septicemia, or VHS, has been found in Lake Michigan waters since 2008. VHS is sometimes referred to as a fish-specific version of the deadly Ebola. It is harmless to humans, but can affect several dozen fish species, including popular sport and commercial fish such as perch, trout and whitefish. The virus targeted thousands of gizzard shad in last month’s fish kill. It’s the first time that species has tested positive for VHS in Wisconsin waters, according to the DNR. Nobody knows how the virus got into the Great Lakes, but a likely explanation is it was carried in by oceangoing freighters. An experiment underway in a small Nebraska town may hold the answer to a common problem associated with industry — groundwater contamination. If the results are as successful as preliminary reports indicate, then researchers will have found a vastly cheaper and easier method that could then be applied to a wider range of contaminates found in the nation’s water supply. “We’re always looking for new, better ways to handle the contamination and obviously the cheaper the better, as long as it can be effectively and safely done,” said Ken Rapplean a project manager at the U.S. Environmental Protection Agency . An estimated 15,000 sites across the country leach toxic chlorinated solvents into groundwater — anywhere an old landfill, dry cleaning facility or military installation might be found. Among the most common is a solvent typically used as a degreaser and metal parts cleaner, trichloroethylene or TCE. It figures that Mr. Lodge, 54, a professor of biological sciences at the University of Notre Dame, would have a decided opinion. He has spent much of his career predicting which foreign species could harm the Great Lakes. And in the decades since Asian carp escaped Southern fish farms and began marauding up the Mississippi River, Mr. Lodge, a nationally known expert on invasives, has become nearly as famous in some circles as the voracious fish. Sustainable water use will be the theme of the Minnesota Ground Water Association’s spring conference on May 4. Speakers include: state Rep. Paul Torkelson, speaking about the Clean Water, Land and Legacy Amendment; Princesa VanBuren Hansen, speaking on the Environmental Quality Board’s 2010 Minnesota Water Plan; and Deborah Swackhamer, speaking on the 25-year water sustainability plan fo the state that was drafted by the University of Minnesota’s Water Resources Center. Other speakers include: Jeanette Leete, speaking on the Minnesota Department of Natural Resources’ process for defining groundwater management areas; and Lanya Ross, describing the Metropolitan Council’s water supply planning for the Twin Cities. The conference will be on the St. Paul campus of the University of Minnesota. For information and to register, go to www.mgwa.org. The Governor’s Council on Minnesota’s Coastal Program, or Coastal Council for short, is seeking applications by April 15 for a number vacancies. There is a particular need for applications from people who live in Cook, Carlton and Lake counties. The Coastal Council is an integral element of Minnesota’s Lake Superior Coastal Program. As part of the Minnesota Department of Natural Resources Ecological and Water Resources Division, the program mission is to preserve, protect, enhance and restore coastal resources for present and future generations. The program provides technical and financial assistance for local communities. The council is made up of 15 Governor-appointed individuals who have a passion for Lake Superior and the desire to make a difference. Members must have some knowledge and interest in Lake Superior. Experience reviewing grant applications is helpful, but not required. Council members are not compensated, but receive travel reimbursement and training. The time commitment is approximately 60 – 70 hours per year. Meetings are held at various locations along the North Shore including Duluth, Two Harbors and Grand Marais. For instruction on how to apply to the Coastal Council, contact Lisa Angelos, Coastal Program manager at 218-834-1443. Around 300 dead fish were found in Lake Agnes and Lake Henry in open water areas after ice had melted. But both residents and experts said they’re not sure why. “All winter long, I’ve been fishing the lake (Henry), and I ran into a situation where we had a four to six foot column of fish, and all of the sudden, they disappeared. I could not find a fish on the lake,” Lake Henry resident and fisherman Rick Colden said. Colden isn’t the only one who’s had a hard time on the lakes, as more than 2,000 anglers failed to catch a fish at a tournament on the adjoining Lake Agnes on Feb. 12. But the recent evidence of fish kill may be to blame. “A lot of game fishes; walleye, bass, bluegill, some crappie, (were found dead). So certainly a concern,” Minnesota Department of Natural Resources area fisheries supervisor Dean Beck said. Pest-control services provided by insect-eating bats in the United States likely save the U.S. agricultural industry at least $3 billion a year, and yet insectivorous bats are among the most overlooked economically important, non-domesticated animals in North America, according to an analysis published in this week’s Science magazine Policy Forum. The value of the pest-control services to agriculture provided by bats in the U.S. alone range from a low of $3.7 billion to a high of $53 billion a year, estimated the study’s authors, scientists from the University of Pretoria (South Africa), USGS, University of Tennessee and Boston University. They also warned that noticeable economic losses to North American agriculture could occur in the next 4 to 5 years as a result of emerging threats to bat populations.